Summary: Free equipment upgrade and get $21 off your monthly bill with DirectTV today. If you've ever considered getting DIRECTV there's no better time to sign up than right now. Their limited time offer grants you access to literally hundreds of channels with digital-quality picture and sound for a substantial discount when choosing from five of their programming packages. 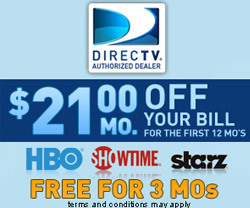 With the new DIRECTV deal, there's something for everyone! When signing up with DIRECTV as your satellite provider there are six programming packages to choose from; their new offer gives you considerable savings on five of their six packages! The six packages to choose from are: Premier Package with over 265 top channels and 31 premium movie channels, Plus HD + DVR package that includes over 200 of the top channels, Plus DVR package with 200 channels and DVR service, Choice XTRA Package with over 200 channels, the Choice Package with 150 channels and the family package that has 45 channels. The PLUS DVR package also includes DVR service and a FREE DVR or HD Receiver after instant rebate. The PLUS HD DVR package includes all the same benefits as the PLUS DVR package, but with the added element of HD Access.